After talking with some of our coworkers we decided to head South to the Philippines for a beach vacation for Christmas. In particular, we chose to spend a week on the island of Boracay. It would be our first tropical Christmas and there weren't any regrets. Upon arrival in Boracay we grabbed dinner, drinks and watched the sun go down. It was certainly satisfying after a crazy day of travel through Manila, a domestic flight to Kalibo, a 2-hour bus ride across an island, and a ferry ride to our island. 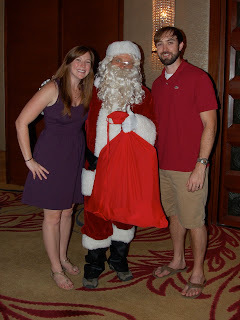 One of our splurges was a really nice Christmas Eve dinner at one of the nearby resorts - the Shangri-La. We had an awesome buffet, two live bands and of course a visit by Santa! The beach was soft and white, the water was shallow, warm and clear and there were tons of people running supplies to and fro in these little canoes. Since it was a school break, tons of kids make a little pocket change by building sandcastles. "Ariel's House" is the restaurant of the place we stayed, and pretty much where we spent all of our "happy hours". Filippinos love them some live music. We get tons of Filippino bands in Hong Kong so we were prepared and we found a few cover artists in a bar called the Hobbit House - at which all of the employees are "little people". Helluva themed restaurant. 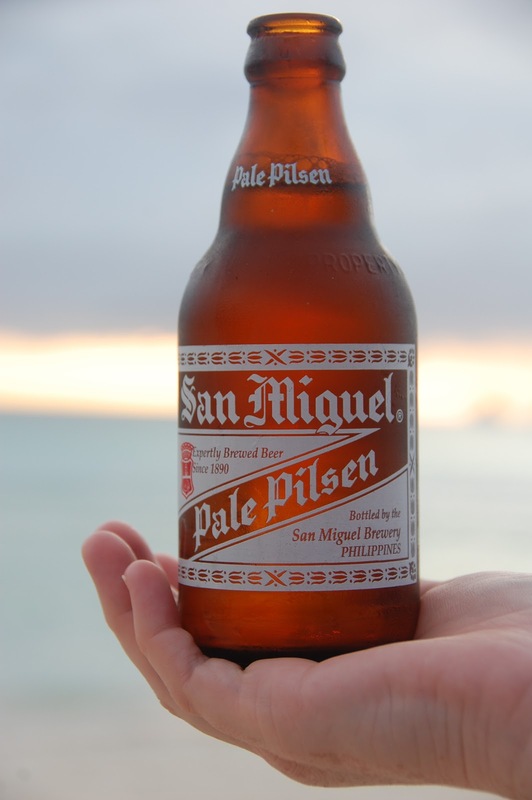 While I used to think San Miguel was a Spanish beer, I have recently been corrected that it is THE beer of the Philippines. You have three options at happy hour: San Miguel Pale (pictured), San Miguel Light (only for teenage girls and small children), and Red Horse (a "strong beer" brewed by San Miguel - my personal favorite). Not sure of the connection with the Philippines, but apparently they love Obama too. Sometimes the kids add some candles to take their sandcastles up a notch. White Beach has a volcanic rock outcropping called Willy's Rock that features a Virgin Mary on the right side - did I mention that the Philippines are big on Catholicism?